Ever since the first man skewered a haunch of mammoth and cooked it over an open fire, we’ve had a fondness for cooking food outdoors. It doesn’t matter that we have fully-equipped indoor kitchens, open-air cooking offers an allure that a microwave doesn’t. But when it comes time to buy a new grill the options are endless. There are a wide variety of grills, from simple charcoal grills that are little more than a way to contain the hot charcoal and a grate to hold the food, all the way up to high-end gas grills with side burners, rotisseries, and smoker functions. Kamado grills, usually made from heavy ceramic, are yet another variation and provide more radiant heat than other styles, so they’re great for slow roasting and smoking. Choosing a grill really depends on the type of cooking you plan to do, your family size, and your budget, and this guide will help you figure out what works best for your needs. Most grills, no matter what fuel they use, operate on the same principle. Heat is produced by burning the fuel, and foods are cooked on a grate where they enjoy a close relationship with the heat source, whether it’s the flames of a gas grill or the glowing heat of charcoal. While the goal isn’t to set fire to the food, the smoke produced from fats and juices dripping from the food creates smoke that helps to flavor the food. The price range for grills is wide, ranging from under $50 to many thousands. And spending more doesn't equate to it being better, it might just mean more power, bigger size, and extra features. 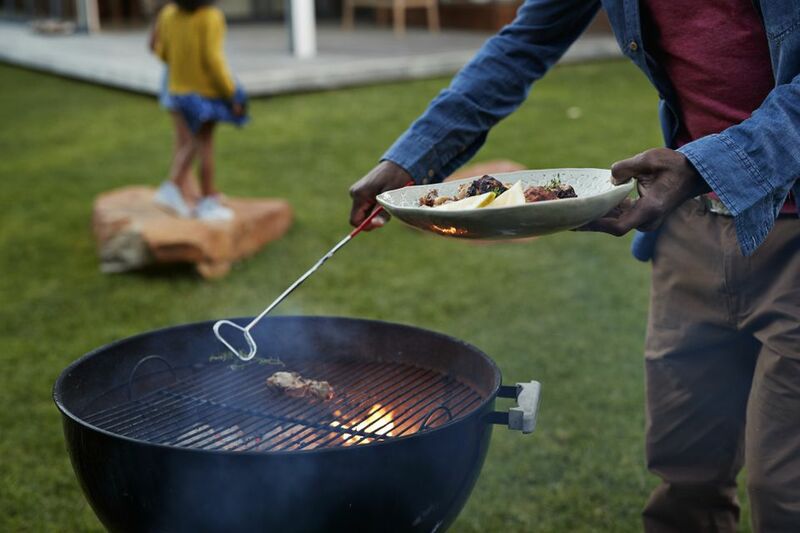 Some people might have a few grills–perhaps they have a portable grill for tailgating, a gas grill for everyday cooking, and a smoker for special occasions. There really is no one size fits all. So if you are a novice griller looking for your first purchase or a grill-master looking for the latest and greatest this guide will help you figure out what you need to buy and why. What to Look for in a Grill? There are several factors to consider before buying a grill. Here are the key features you should keep in mind before making a purchase. Fuel: The first thing to decide when purchasing a grill is what sort of fuel you prefer. Charcoal briquettes are easy to find and are sold in a wide variety of stores, from grocery stores to hardware stores to convenience stores, and even gas stations. The downside of charcoal is that lighting it can be difficult for some people, and you have to plan ahead to have the charcoal ready to cook when you are. Gas grills run off of either propane which you buy in tanks or natural gas which requires a gas connection near your grill. While propane is popular, it’s not as ubiquitous as charcoal. Wood pellets grills and lump charcoal offer a flavor boost, but these are not as easy to find as either charcoal or propane. Once you know which stores in your area carry these, you’ll know where to shop, but it might not be as convenient as stopping at a convenience store on the way home. Electric grills only require an available outlet to plug it in. Since you never need to run out and buy fuel, these are convenient, but generally, don’t offer the same flavor as a grill that uses live fire and smoke. BTUs: When shopping for a grill you're sure to come across the measurement for BTUs. BTUs are a measurement of energy. The name is actually an acronym for British Thermal Units, but it’s widely used in the US for rating the energy of stoves, air conditioners, and gas grills. When it comes to grill BTUs, higher numbers mean the grill burns more fuel and produces more heat from its burners. But higher doesn't always mean better, there are other things you need to consider when purchasing the grill. An aluminum construction grill might heat up faster but it will cool quicker, thus the higher BTU rating here won't necessarily mean more heat. You'll need to consider the make of the grill as well as some of the other factors below when making your final decision. Basically, don't pay to much attention to the BTU rating when purchasing a grill. Cooking Area: If you plan to just cook burgers, steaks, and hot dogs on the grill you can see how many items the manufacturer says the model will fit at a time and use that to see how it aligns with your family and entertaining needs. If you plan to be a bit more adventurous on the grill—you might want to go larger so you can utilize indirect heat to cook larger pieces of meat like a whole chicken or even grill a turkey. So going a little bigger might always be better if space allows. Size and Portability: Grills come in a dizzying range of sizes, from small portable grills that fit in the trunk of your car, to large, heavy grills that would take two people to move or that are built-in permanently. If you’re never going to take your grill on the road, larger models tend to offer more options, but it’s always wise to consider how much yard or deck space the grill will take, and how easy it is to move if you need to reposition it or move it into storage. Grill Grate Material: Grill grates come in several materials, with enameled cast iron and stainless steel being the most popular. When it comes to cooking performance, the difference between enameled cast iron and stainless steel is negligible and can be offset by the shape and configuration of the grates themselves. Maintenance is the same, requiring a good scrubbing with a grill brush. The real difference is in longevity. It’s virtually inevitable that the coating on cast iron grates will chip or crack, and that will lead to even more degradation until the grates begin to rust. This takes time, but it will happen. Stainless steel grates are impervious to rust, salt, and heat. While they will darken and discolor, this won’t affect cooking performance at all, and you will never need to replace them. At the low end of the price range, you may find grill grates made from chrome plated steel. While these won’t last nearly as long as the other types of grates, they’ll last long enough for the type of grills they come with. Grill Body Material: Just like every other aspect of grills, the material they’re made from varies widely, and along with those variations come pros and cons. While the vast majority of grills are made from some type of metal, many of the kamado grills are made from ceramic or a similar material which is very heavy and retains heat well. Aside from kamado grills, stainless steel and coated steel are the most popular options. Stainless steel tends to be more expensive, and it will never corrode or rust. It’s also impervious to salt, which might be a consideration if you’re near an ocean. Stainless steel can discolor from heat, which won’t affect its performance, but it will affect the aesthetics. Coated steel can offer you color options, and it will resist rust as long as the coating remains undamaged. Over time the coatings can crack or chip, which can then lead to rusting. While not as important as the grill body, the materials used for side tables, legs, cabinets, and other parts can affect the grill’s appearance and longevity. Cost: Since there is such a wide range of cost when it comes to grills, you can choose a price point that fits perfectly within your budget. While less expensive grills will have fewer features, they are also the ones that tend to be smaller, lighter, and more portable, which are advantages for people who need to transport the grills or store them in between use. At the most expensive end of the range, a grill might be even more versatile than a stove but they're often heavier more permanent fixtures in your backyard. What Is the Best Type of Grill for Me? There is no one size fits all when it comes to grills. Gas grills offer ease and convenience. You just turn the gas on, press the igniter and you are ready to start cooking up some hot dogs. You can set the temperature more accurately then dealing with charcoal. But these grills don't get as nice of a char or smokey flavor as their charcoal or wood counterparts. These grills operate on either propane or natural gas, and some are convertible from one to the other. Propane grills use refillable tanks for their fuel supply, which you'll have to buy at a hardware or grocery store while natural gas grills are connected to a permanent gas outlet. Propane grill costs start in the sub $100 range with small camping stoves at the very low end and can reach $4000 and more for high-end models. Natural gas grills tend to be in the mid to high end of that range since they’re designed for more permanent installation. If it is that smoky flavor you crave you'll want to opt for a charcoal grill. These grills impart a nice char on foods and give you that taste that is synonymous with grilling. Charcoal grills tend to be less expensive than similarly-sized gas grills since there are no controls to contend with—you simply load charcoal onto the bottom grate, light it, wait for it to burn down a bit, then do the cooking on the top grate. Charcoal grills range from $20 for small, nearly disposable models to $400 for those with at least a few bells and whistles. While charcoal is an inexpensive fuel, if you use your grill often, you’ll be lugging home heavy sacks of charcoal on a regular basis. The other downside of charcoal is that it takes time before you’re ready to cook since the coals need to burn for a while before they’re ready to be used. So if you grill a few times a week or have a busy household this might not be the right fit for you. When cooking is done, you'll need to dispose of the coals so it’s wise to make sure all the coals have burned out, to make sure there’s no risk of setting the deck on fire if hot ash or small coals are still burning in the grill. Do you want the option to smoke or grill your meat? You might want to try a Kamado grill. Kamado grills are a very special type of grill, with a distinctive shape, almost like a very large egg standing on its small end, with a flattened bottom. They’re typically made from a thick ceramic material that absorbs and retains heat, making these grills ideal for roasting or smoking. They can also be made from other materials, including some that are all metal. Kamado grills are often fueled with lump charcoal, although other fuels are possible. Like charcoal, you will have to make a fire to get the heat up so they aren't as convient as gas. Because of the thick ceramic construction, these grills are very heavy. While many are sold with stands that have wheels, you might not want to move them very often. Kamado grills range from under $200 to well over $1500, with well-equipped models in the middle of that range. For people who want the ability to slow-smoke their own brisket, bacon, and other foods on a regular basis, a smoker is required. Many of these grills use wood pellets that impart different smoke flavors depending on the type of wood, while others use a separate fuel source for heat while using pellets or chunks of wood to create the smoke. In addition, some pellet smokers also require electricity to operate fans, an auger system, or other components. While some smokers are just smokers and nothing more, others can also be used as a standard grill. You’ll find smoker grills from under $300 to well over $1000, depending on the features. If you’re planning on cooking long-smoked meats, it’s wise to invest in a grill that automatically feeds the wood pellets into the fire or tending the grill could be a long, tedious task. While electric grills may never give you the same smoky taste as a grill that uses live fire, they’re a great option for people who can’t have a gas or charcoal grill on their apartment balcony, or for folks who don’t want to fuss with having propane tanks or bags of charcoal on hand. The downside is that the grill needs to be within the range of an electrical outlet, but on the plus side, some electric grills can be used indoors, so you can finish cooking comfortably if a sudden storm arises. Another con is they can be hard to clean. Electric grills range from sub $50 to about $400, so they’re affordable. Weber: Weber is known for its distinctive charcoal kettle grills, but they’ve also become well known for their quality gas grills. Even at the lowest price points, the grills are well built and reliable and carry some of the best warranties you’ll find, including coverage against rust. Char-Broil: Char-Broil has a long history making grills, and typically sells them at a more modest price than you’ll find from Weber. While these are certainly not the highest-end grills on the market, they are solid performers and can fit your yard without breaking your budget. Traeger: While Traeger may not be well known among casual grillers, they might be the best-known name when it comes to pellet smoker grills. These grills are built for success and have impressive features that will make smoking much easier, even for beginners, These also come with a community of users who just love their grills. Kamado Joe and Big Green Egg: These two brands are neck-and-neck for the title of best Kamado grill, with proponents on both sides, and they look very similar. Which has more features might depend on who just released a new feature. Both brands make quality grills and accessories, so you can buy either with confidence. Coleman: While Coleman doesn’t have a reputation as a maker of backyard grills, they are very well known for camping gear. Coleman grills are small, lightweight, and ideal for taking with you whether you’re camping or picnicking. George Foreman: George Foreman brought the idea of electric grills into the mainstream with his lean, mean, grilling machine. The brand still produces some of the top-rated grills in this category with options for standalone units to ones that can sit on inside on your kitchen counter. While a basic grill will get your food cooked they're some accessories that can make grilling not only easier but tastier. Rotisseries give you more cooking options. Higher-end grills might include this option, while rotisserie attachments can often be purchased separately for other models. Side burners: If you want to cook the whole meal outside, a side burner is a nice accessory that lets you heat sauces or cook side dishes next to your main course. Fuel Gauge: Losing gas mid barbecue is never fun. If you are tired of playing the guessing game or always having to have a spare handy you might want to spend a little more for a gas grill that has a gas gauge built-in. Side Tables: While many gas grills already have side tables where you can rest your serving platter some charcoal grills also make this option which can give you more cooking space. Gas Ignition: While you get this feature on most gas grills, some charcoal grills now have a gas ignition option that will use propane to help heat up your charcoal cutting down on your preheat time. Integrated Thermometer: While most gas grills have thermometers which can tell you how hot your grill is before you start cooking not all charcoal models do. If you want to be sure of the temperature you are cooking at, be sure to get one with a thermometer or purchase one separately. Grills take a lot of abuse, with grease flare-ups, high internal heat, exposure to all sorts of weather, and barbecue sauce spills, so its good to know what sort of warranty you can expect. Unfortunately, warranties are all over the map when it comes to length of time and what is covered. Some warranties only cover manufacturing defects, while others cover rust as well as burn-through damage. Warranty lengths can vary from as little as 1 year to up to 10 years, depending on brand and model. Some warranties have multiple levels, with burners, bodies, and other components all having different lengths of coverage. In addition, some resellers, like Amazon, offer their own warranties as well as extended warranties that might cover more than the manufacturer does. It’s all very confusing, so make sure you read the warranty information before you buy.